Hello everyone, thanks for inviting me. I am Mei-Shin and I would like to introduce the workflows for computer-assisted language comparison. Before I introduce our workflow in detail, I want to explain quickly what we mean when talking about “computer-assisted language comparison”. 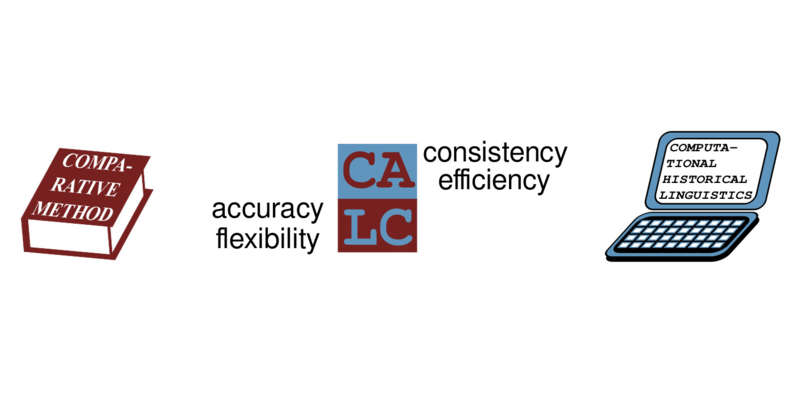 The comparative method has been the key method of historical linguistics since the 19th century. Originally, it was applied to the Indo-European languages, developed by scholars like R[ʁ]asmus R[ʁ]ask and Jacob Grimm. Since then, it has been applied to many other language families. 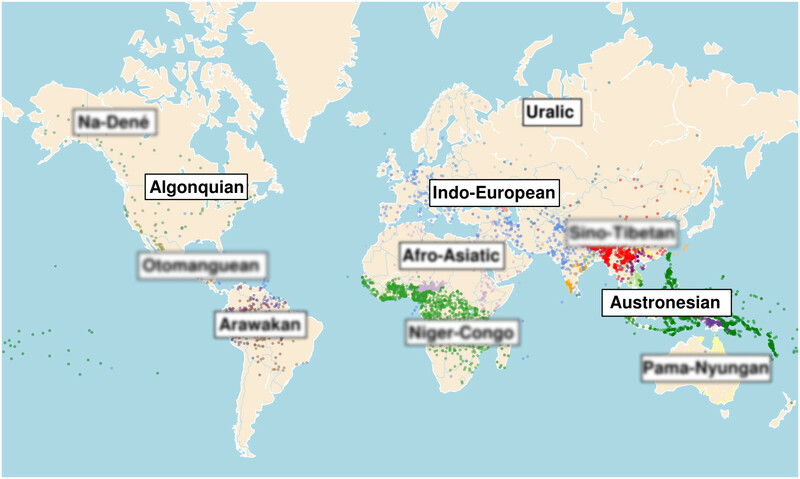 But our knowledge of the history of most of these language families is still rather fuzzy. The reason is that the comparative method is very tedious to apply. Also, comparing with computers, human lack of consistency and efficiency. However, it has a high accuracy and a high flexibility. Computational methods, on the other hand, are by nature consistent and efficient, but they lack accuracy and flexibility. This calls for a new framework of computer-assisted language comparison, following the idea in many computer-assisted disciplines. By combining the efforts, we can get the best of two worlds, the efficiency of computers, and the accuracy of humans. we offer interfaces that allow humans and machines to access the data at the same time. The basic idea behind computer-assisted as opposed to computer-based language comparison is to allow scholars to do qualitative and quantitative research at the same time. Our workflows for computer-assisted language comparison have so far been intensively tested on a small set of 8 Burmish languages, which we investigated in collaboration with Nathan Hill, who was responsible for the qualitative investigation of the data and for the common discussion of new computer-assisted methods which were then implemented by Mattis List. Our experience with this Burmish project allows us to set up this workflow that starts from raw data to the explicit identification of correspondence patterns across multiple languages. At the moment, List and Hill develop the workflow further to account also for (semi)-automatic reconstructions, but in this talk, only the identification of correspondence patterns will be discussed. This picture presents the full workflow, it comprises 5 different processes at this moment, in which we successively lift linguistic data from their raw form up to a level where correspondence patterns across cognate words have been automatically identified and can be qualitatively inspected by the scholars. Some technical terms on this picture may look unfamiliar to you, but the ideas behind these applications are actually being practiced by linguists for quite some time already. In the following, we will discuss these ideas in detail, and you find even more detailed information in the handout accompanying this talk. The data we use to illustrate our workflow was originally collected by 陳其光, and later added in digital form to the Wiktionary project. Chén's collection of frequent terms comprises 885 different concepts translated into 25 varieties of Hmong-Mien. 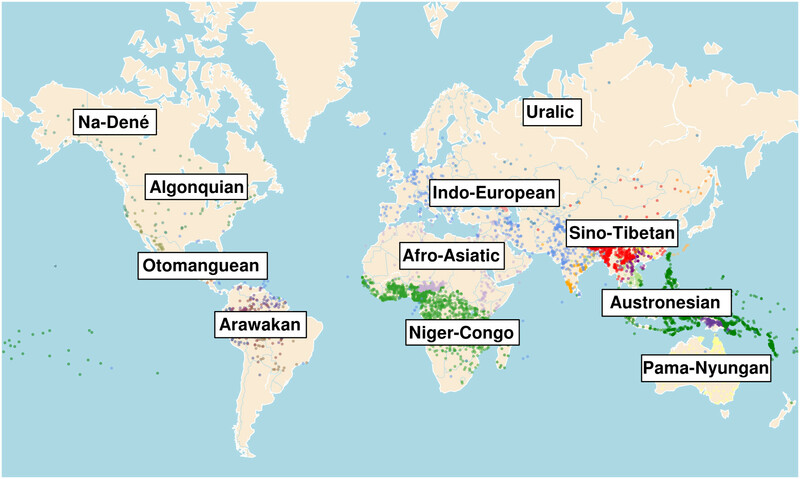 In this talk, we extract 10 Hmong-Mien languages for the demonstration, and the map here presents the geographical locations of these languages. The first step is to convert raw data to a machine readable format. I will try to explain in detail, what this means. To see in detail, what this means, let’s have a look at one exemplary page from Chén’s book, with the data, as it has been prepared by the SEALANG project. We can see that the data is essentially the same, but that the rows and columns of the tabular form have been swapped. We recommend to use Orthography Profiles to convert all kinds of transcriptions to consistent IPA and segment the data at the same time. An orthography profile is nothing else than a table, in which you list the combination of characters in the original transcription in the first column, and how it should be converted in a second column. And once we applied the profile, our data looks like this. Note that the plus-sign here indicates, that the word consists of two morphemes. Now, we come to the second stage, in which we try to infer partial cognates from our segmented words. Compounding is an important element of word formation in South-East Asian languages. The presence of compound words challenges the notion that words can either be cognate or not. This picture shows an example of words for “moon” in 4 Sinitic languages, the words that should be cognates are marked in the same color. For example, ŋuoʔ5, ŋiat5, ȵy21, yɛ51 are all cognate with each other. But Meixian has another morpheme which means “light” in Mandarin Chinese, and Wenzhou has two morphemes kuɔ35 vai13 after the moon morpheme. If we allow words only to be cognate or not, we probably should say that we have four different cognates here. To account for partial cognates in our data, we use a different annotation schema. In this schema, we assign each morpheme a cognate ID, and if two morphemes have the same ID, they are thus meant to be cognate. List et al. (2016). Using sequence similarity networks to identify partial cognates in multilingual wordlists. In Proceedings of the 54th Annual Meeting of the Association for Computational Linguistics (Vol. 2, pp. 599-605). With the method by Mattis List et al., proposed in 2016, we have a rather simple and efficient approach to automatically search for cognates in linguistic datasets. Although the algorithm is not very complex, it would go too far to explain the details here, I am afraid, and therefore, I will only show this nice graph, that illustrates the different stages, and tell you that the core idea is to model the data with help of networks. If we apply this method to our data, we get results that look as follows. All words are given cognate IDs by the algorithm, depending on how many morphemes they have, and if the IDs are identical, this means the algorithm judges the words to be cognate. In the third stage, we want to align the cognates we detected. Phonetic alignment techniques are well-known in historical linguistics and have been applied for quite some time now. Phonetic alignment techniques are well-known in historical linguistics and have been applied for quite some time now. As the figure shows here, cognate words (here all meaning “seven”) are arranged into a matrix so that corresponding segments are placed in the same column. This is essential to identify sound correspondences. 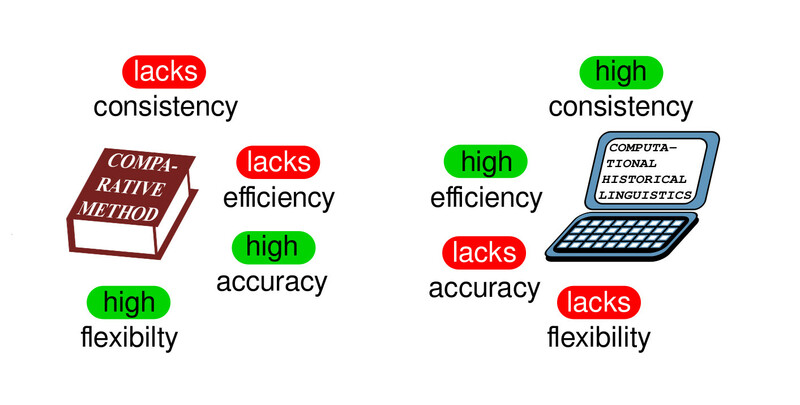 Nowadays, we have stable algorithms for multiple alignments that yield accuracy scores almost comparable to the differences we would expect between human annotators only, and we also have web-based tools that facilitate manual alignments greatly. This picture, for example, is taken from the EDICTOR application, and I will show you how to work with this tool in the last section. But even if this helps to save some time, it is still tedious to correct alignments manually. We propose Template-Based Alignments as an alternative to semi-automatically computed alignments. Languages with a rather restricted syllable structure can usually be aligned in a very consistent way by simply using a template. A typical Chinese syllable, for example, consists of initial, medial, nucleus, coda and tone (Wang 1996). Once we know the individual template of a Chinese word, we can easily align it with any other word, as long as we know the template. We propose Template-Based Alignments as an alternative to semi-automatically computed alignments. The major idea is, that languages with a rather restricted syllable structure can usually be aligned in a very consistent way by simply using a template. A typical Chinese syllable, for example, consists of initial, medial, nucleus, coda and tone (Wang 1996). Once we know the individual template of a Chinese word, we can easily align it with any other word, as long as we know the template. Here is an example for this workflow, provided we know the template for the words in our data. We start from the tokens, and we use the Structure column to provide information on the template. Now we use a meta-template of the general syllable structure of the languages, and then we drop all those columns, where we do not find a sound. The problem is of course, how to make the templates for the words in our data? Here, we can again use orthography profiles, along with a variant in which we can provide rudimentary context, here expressed by the circumflex symbol for the beginning of a word, and the dollar sign for the end. We just add another column, and in this column we provide the structure, the template, for the given sub-sequence. You find more information in the handout. The output file then has two more columnes which is called “Alignment” and “Structure”. We are almost done, we now need to infer the strict cross-semantic cognates from the data. For a realistic analysis, we need to identify cognates not only within the same meaning slot, but across different concepts. 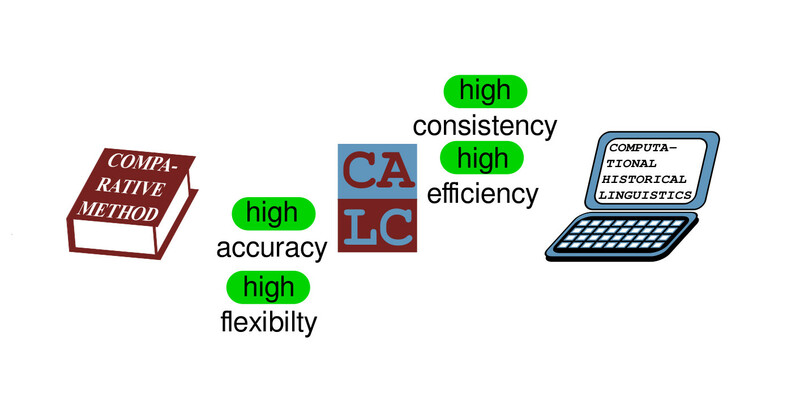 However, our algorithm for automatic congate detection designed to search words with the same meaning. Therefore, we need to find cross-semantic partial (=normal) cognates in a second stage. For a realistic analysis, we need to identify cognates not only within the same meaning slot, but across different concepts. However, our algorithm for automatic congate detection designed to search words with the same meaning. Therefore, we need to find cross-semantic partial (=normal) cognates in a second stage. For this task, we employ a new algorithm to merge cognates in our data into larger groups. The basic idea is to check if two alignments are compatible with each other, and to fuse them to form a bigger alignment, if this is the case. As a side effect, all words we identify in this way are strictly cognate, since our procedure does not allow to identify a morpheme in the same language to be cognate if this does not show the exact same form. For this task, we employ a new algorithm to merge cognates in our data into larger groups. The basic idea is to check if two alignments are compatible with each other, and to fuse them to form a bigger alignment, if this is the case. As a side effect, all words we identify in this way are strictly cognate, since our procedure does not allow to identify a morpheme in the same language to be cognate if this does not show the exact same form. Here are some examples for the morphemes we found in the data, which recur in different words. Here we give another example to show you how actually it is done. I would like to draw your attention to the 東黔東 language. The tei²⁴ in Son and tei²⁴ in Daughter were not in the same first analysis, in the “cognacy” column, but now, after our analysis, in the cross-semantic column, the algorithm found them to be related, because the word is identical internally, and our test with strict alignments accepted this. And this is, how this all looks in our table. You cannot see many differences here, but you can see that the morphemes in MOON have been added to other sets of morphemes, and we generally find a lot of crosssemantic cognates in our data. We can now start to search for sound correspondence patterns. 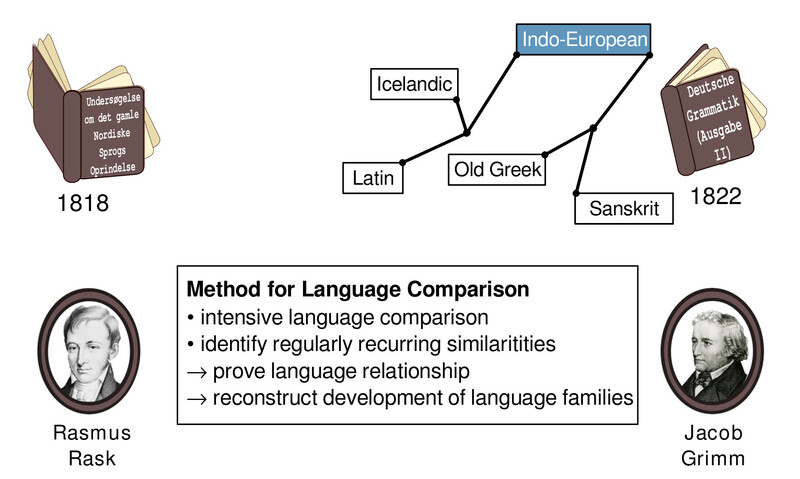 Most linguists are probably familiar with this kind of representation: Clackson shows, how sound correspondence patterns are distributed over the Indo- European languages. But if we look at tables like this one, there are several problems. We don’t know the frequency of the occurrence of each of the patterns, we do not know the number of cognates in each individual language, or the context, in which they occur. This makes it quite difficult to learn from text-books, but also to criticize a theory and to try to improve it. A better example is provided by Martha Ratliff’s study on Hmong-Mien in 2010. This table shows us the cognate sets she used in the study, so in a way, it’s more transparent than the previous example. But there are remain some problems: (1) the table does not provide the full words in the examples, but only the morphemes (2) the table does not provide us with information on the degree to which patterns are inconsistent, reflecting secondary variation in the individual languages (3) the representation is only to some degree machine-readable, not only because it is not digitized, but also because we do not know completely to which correspondence pattern (or set) each of the other sounds in the data belongs, and we will have problems to check the consistency of entire words when given the data in this form. In our proposal for the handling of sound correspondence patterns, we propose a different format, and specifically an interactive way of inspecting patterns, along with an automatic analysis by which the patterns can be inferred in a first place. The result of this automatic analysis is like a table, in which languages are placed in the columns, and correspondence patterns are placed in rows, with each cell indicating for each individual correspondence pattern, which reflex sound a given language shows for this pattern. In this format, everything can be traced back to the original data, no data is “missing” It’s also interactive, which I will demonstrate soon. EDICTOR: a web-based tool to edit, analyse, and publish etymological data. Semi-automatic reconstruction (currently tested by Nathan Hill and Johann-Mattis List). Clearer integration of automatic and semi-automatic methods in the workflows. Enhancing the visualization of the results (Xun Gong is working on this for the Burmish Etymological Dictionary project). Lexical reconstruction: how can we reconstruct whole words? Sound change: can we represent all changes from a proto-form along some phylogeny along with sound laws?